This is a pose you can meditate in. It also stretches the knees. An easy yoga posture to enter this posture from is Balasana the Child Pose. It can be done sitting on a block or cushion if you have knee problems or they are inflexible. Interlock the hands and stretch the arms upwards. This will stretch the shoulders. This yoga posture is quite often performed for meditation instead of sitting with the legs crossed. Perform this posture for meditation if you prefer it. You may want to sit on a block or folded blanket while performing this posture. It will take some of the strain away from the knees and allow you to stay in the posture for longer. Yoga posture like the Pigeon Pose (Kapotasana) and Half Lotus (Ardha Padmasana) bend the knee and rotate it one way. This yoga posture also bends the knee joint and rotates it the opposite way. Therefore it is a good counter balancing yoga posture for the knee joint. If someone has a knee problem this posture may not be suitable. It can be tried with support but gaining flexibility in an injured knee must be done carefully and over a log period of time. Get lots of feedback from your injured students. Include both immediate feedback and feedback on how they responded after the last session. 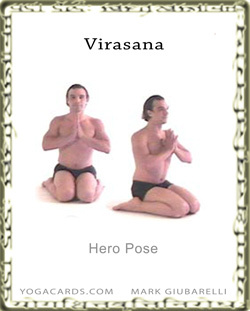 Virasana Hero Pose is a pose that you can meditate in. It also stretches the knees.